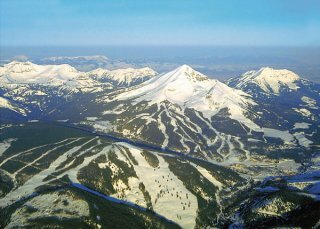 Big Sky, MT – At 5,750 acres, Big Sky was already the largest ski resort in America heading into this summer, when the mountain’s work crews set out to break the 5,800-acre mark in time for this winter. Extensive glading during the off-season will bring new runs and more fun for intermediates and experts this winter season at Big Sky. The expanded terrain is included on the mountain’s new trail map design, revealing a different aspect of Big Sky’s terrain and the new runs. The Southern Comfort chairlift, off of Big Sky’s Andesite Mountain, saw the most improvement through glading with two new intermediate runs. The new “Lizette” run is located between the runs Deep South and Sacajawea and the new “Pomp” run is located between Sacajawea and El Dorado. Both new tree shots are named after Sacajawea’s children. A section of the Ponderosa run, also off the Southern Comfort lift, was also widened. Another new intermediate glade can be found this winter between Lone Mountain’s Lower Morning Star and Mr. K runs, named “Lois Lane”. A new black diamond run — “Soul Hole” — was thinned between Lobo and Calamity Jane. Both are accessed via Big Sky’s Swift Current chairlift. The Mountain Operations crew also upgraded the existing Tango Trees run, below the Lone Peak Triple, through selected thinning and removal of standing dead trees. On the southern exposure of Lone Peak, the crew did careful thinning of select trees on the Dakota Gully run. It will now be regularly groomed, changing its designation to “intermediate” to allow more skiers and riders to utilize Big Sky’s Dakota lift. “Another goal beyond improving the tree skiing experience was to continue to promote healthy forest and improve wildlife habitat,” explains Mike Unruh, Mountain Operations Director at Big Sky Resort. In addition to the four new glades, Big Sky’s new trail map now has the majority of the resort’s terrain on a single side of the map, with two additional insets of Lone Peak focusing on the south-facing Shedhorn/Dakota area and Lone Peak’s more technical and advanced duns on its eastern face.